A first peak at the still unblocked Rosebud mittens. The weather has been terrible for several days, and it has not motivated me to block the mittens. But I have finished knitting them, and the pattern is written down. So, as soon as the mittens are blocked, the weather has brightened up some and my mitten model is ready for a photo shooting, you’ll have more pictures AND a pattern for these mittens. I wish you all and everybody a Happy New Year 2007, with lot of quality knitting time and fabulous yarns, but most of all, with health and happiness. I managed to finish two knits between Christmas and New Years Eve, and here will follow short glimpses of them. 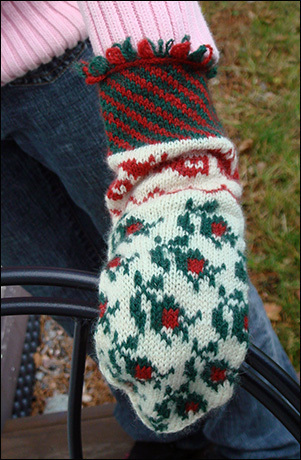 A more detailed post with modelled pictures of the mittens will be here next year. 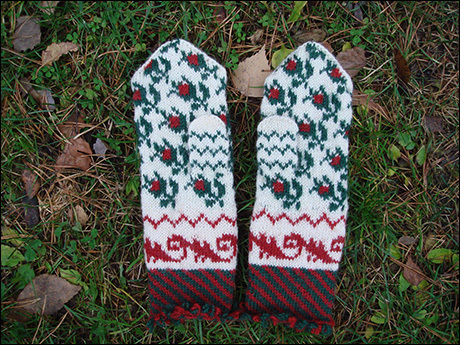 Fresh on the blocking board, the Rosebud mittens. I managed to finish the thumbs of the Rosebud mittens yesterday evening, and they are now resting on the blocking board. They were before blocking sticking like gloves to my daughter’s hands, it will be interesting to see if the quite brutal blocking will gain a centimetre or two, and they would be welcome. If not, then they will go to my niece, who is three and has lot of time to grow into them. Posing in front of the Christmas tree. I started and finished a pair of Jaywalkers. Actually I started them before Christmas, but never came around to blog about them. The yarn is the Regia 4fädig Mini ringel colour self-striping yarn that I got from my Secret Pal this autumn, knit on 2.25 mm needles. I'm not in love with the pattern, it was a bit boring, but my older daughter loves them. The colours were also more me when the yarn was in the ball, knitted up they are brighter than I prefer. Plans for the new year? A pair of mittens for my son and a pair of socks for the younger daughter, but more than that is not scheduled. The spring will be busy, in a good way, and I'm afraid my knitting time will be even less than it has been in the autumn. A Solveig Hisdal sweater is on the dream-list, but I must think about that project more, I want to have some shaping in the sweater. Thank you for reading my blog and thank you to everyone who has left a comment. I try to answer the comments, but sometimes will time be short, and answering left out. Anyway, thank you all! It has been a fun year, this first blog year! See you in 2007! The second Rosebud mitten is started, and FO Pomatomus socks. Cast on the required amount of stitches. After knitting one stitch, move the yarn around a flat piece of wood or plastic, from the front to the back. After two stitches and three loops in one colour, knit the next stitch with both colours, and make the next loop with the new colour. All cast on stitches are knitted and fringed. Remove the wooden measure. Knit next row with the main colour. Knit every stitch trough the stitch and the underlying stitch from the cast on row. After the first row, straight out all the fringes by inserting a needle trough the loops and gently thug them down. This week was disturbed knitting wise by an exam, but the Pomatomus socks were finished and blocked in the beginning of the week. They are warm and nice to wear, and I like them a lot. The yarn, Piece of Beauty’s Robe&Bowl yarn is so soft and nice in the hands. It lost a little bit of red dye in the wash, but not enough to change the colours visible. The colour is off as usual with flash. This yarn is not flash friendly! Yarn: Piece of Beauty 100 % wool in the colour Robe & Bowl, 85 grams. Alterations: I did only two pattern repeats in the leg part of the socks. And more miniatures: The bears got a scarf from the rest 15 grams of the Piece of Beauty yarn. Pattern: Shifting sand by Grumperina. Needles: 2 mm. If you cable without cable needle, try it out! It is a fun pattern, and easy to knit. We had pretty hard winds here yesterday, but nothing happened on our yard, no fallen trees or such. The good thing was that all the oak leaves were thrown from the tree by the winds, so we spent Sunday collecting leaves and taking them to the compost heap. The work went so well that I almost forgot to take pictures of my finished Haruhas. I did knit them with my winter coat in mind, you see those slits? They can be pretty cold when the wind is whirling around one's arms. The Haruhas are much longer than the pattern model, just because I wanted them to cover my lower arms. I will of course also wear gloves, but my gloves are just and just reaching the end of the slits, and from there on will the Haruha take over. But I think they will be pretty useful in cold libraries too. Pattern: Haruha by Kristel Nyberg for Ulla neulelehti. Yarn: 100 % wool from Greece, given to me by my still very Secret Pal. Alterations: I did knit them longer. There are four medallions on the cuff of the model, I have seven. See all entries on Haruha. And there has been some progress made on the Rosebud mittens too. They look even more uneven than in real life, sight. But they will even out after a good soak and blocking, I know. The Bayrische socks are also coming along nicely, but I forgot to take a picture before it got too dark for it. Another day, friends. All this knitting on small needles has made me long for a bigger needle project. With father's day coming up, I'm thinking about a Sharfik by Grumperina in lovely soft Jaeger Extrafine Merino and 4 mm needles. And I do still have some Rowan Linen Drape, that would need to be knit up on about 3,5 mm. The two balls in light lilac would make a lovely shawl for my younger daughter, but what to do with 5 balls in dark purple. A top would be one solution, but I'm open for ideas. The new Satakieli yarns have been very tempting on the needles, and I have knitted way more than I should this weekend. One reason has been watching football, there is not so much to do when the girls are warming up, except to knit. The tournament went well, the girls won two games and played one even. This is the basket weave mitten, knit with the blue green Satakieli and after a suggestion from Memmu, with golden Satakieli as contrast colour. Sofia, the younger daughter, saw these mittens, and forgot everything about what she had wanted before. Her mitten world was filled with this mitten. And that was a good thing, since what I hadn't taken into consideration was that being knit with three strands of yarn the mitten will be significantly smaller than when knit with two strands of yarn. Sofia's hand was the only one in the family that would fit into this mitten. Being knitted with three strands of yarn will also make them warmer than when knitted with only two. The pattern is from Eeva Haavisto's book Sata kansanomaista kuviokudinmallia, and she gives the credits for the pattern once again, to Jalasjärvi. Her original was knitted in black, with red as contrast and white as background. Must be a quite impressive combination! The cuff is very long, a good thing for a mitten made for a very mobile child. Knitting with three strands is a bit trickier than knitting with only two, but the result is quite nice. Do you want to have a close up? Click away and you'll get it! These are the mittens I had already started for Sofia. The white and red yarns are Satakieli, the green Isager Tvinni, bought some time ago in Copenhagen. 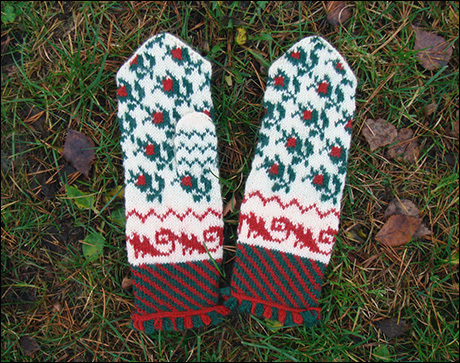 The pattern is one that you can find as well in Eeva Haavisto's book as on a pair of mittens in the National Museum collection of old Finnish mittens. 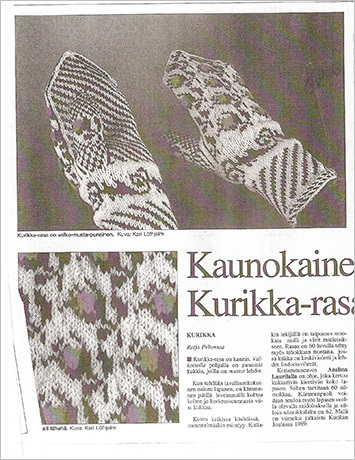 Haavisto says her model is from Kurikka, and it is knitted in white, black and red. The model in the museum collection is knitted in green, red and white, and is said to be from Ilmajoki. Kurikka and Ilmajoki are about 15 kilometres from each, and the distance from Kurikka to Jalasjärvi is about 25 kilometres. So we are moving on a very small area in the south of Pohjanmaa here. I haven't seen the model in the museum collection personally, only a picture of it, and I think the cuff was made in a little different way, it looked like it had more structure in it. I can't swear either that the pattern is exactly like what I have knitted. 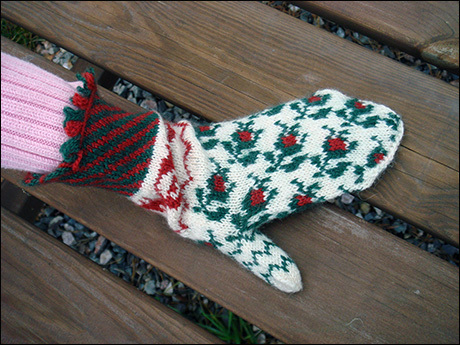 The museum picture has been my inspiration, but I have used Haavisto's pattern for the mitten. The lower pattern, above the cuff, is called "ässänväärä", and is a pattern that is used in several different art forms in Pohjanmaa, for example on painted furniture. It's a typical rococo ornament, and believed to have come to Pohjanmaa from Sweden. The flowers above the ässänväärä are looking like rosebuds, so I call the mittens rosebud mittens. On both of these mittens is the thumb made as I think they were made before in Finland. It's a straight thumb, with the thumb stitches stored away on a tread, and new stitches casted on above (this is by the way my grandmother taught me to knit mittens eons ago). I did cast them on in the colours that would have been used for the stitches; I don't know how much it will matter when the stitches are picked up. 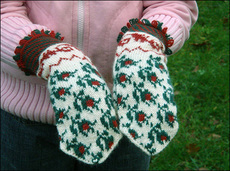 The tops of the mittens will be finished in two different ways, more on that in next post on the mittens.